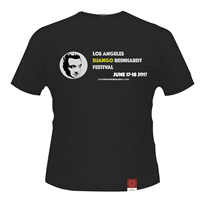 All proceeds of T-Shirt sales benefit the continuation of the Los Angeles Django Reinhardt Festival. Printed on BELLA+CANVAS cotton T-Shirt. DjangoGuitars.com!